A spotlight was shone on the money men and women doing their bit to get social ventures off the ground last night in the City of London. The Social Investment Awards, organised by the Cabinet Office, recognised organisations in five categories at NatWest’s HQ in Bishopsgate. Minster for Civil Society Rob Wilson (pictured below) gave a short welcome before heading back to the House of Commons to vote on a motion. Before departing, he hailed the importance of social investment, describing it as "transformational" and revealed that he’d been involved in reforming the regulatory framework of charities. "The charities act will enable charities to make investments to contribute to their charitable mission as well as providing a financial return. 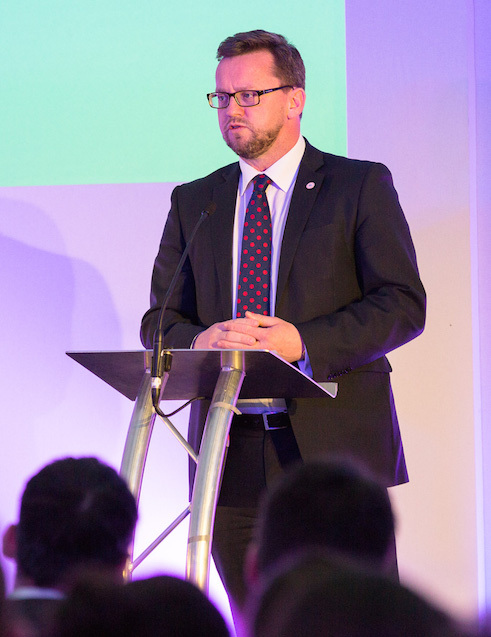 I hope this sends a strong signal to both the charity sector and the wider investment community that this government is committed to seeing social investment grow," said the minister. He also paid tribute to hosts NatWest: "This market will become mainstream business for banks in the future." Bridges Ventures was the big winner of the night, picking up both the Public Service Transformation Award with Career Connect for a social investment deal that has improved public services and the Institutional Social Investment Award for a deal or product that has created demonstrable social impact at scale. Career Connect works with young people not in employment, education or training (NEETs). The organisation was engaged by the Department for Work and Pensions (DWP) to deliver a three year project called New Horizons, helping disadvantaged 14-19 year olds on Merseyside move into education or employment. Bridges put up part of the capital for Career Connect to do the work through their Social Impact Bond Fund. Winning the Social Entrepreneurs Investment Award was Spacious Place, for its work transforming a cotton mill into a community centre that also houses a call centre offering training and support to help vulnerable local people including some ex-offenders, back into the world of work. The organisation's charismatic CEO Ian Scholes paid tribute to co-winners Social and Sustainable Capital (SASC). He said it was “great to just listen to people who had some cash and some understanding of what we were trying to achieve and who believed in what we believed in”.